When you go to the store, you always see salmon marinated in dark sauces: bourbon, teriyaki.. I guess I could have done the same but I thought why not use all those sauces I have in my fridge so here it is. Ingredients for 4 : 2 filets of salmon, 4 tbps of light soy sauce, 4 tsp of mirim, 4 tsp of oyster sauce, 4 tsp of hoisin sauce, 4 tsp of fish sauce, 4 tsp of old fashioned mustard with grain. Mix all the ingredients mentioned above and mix well. Place the salmon filets in a ziploc bag. Empty the mixture atop the salmon. Close the bag. Shake the bag well so that the mixture will coat the salmon and let the salmon marinade for 30 minutes and up to 2 hours. Remove the salmon filets from the bag and place them on top of a silpat that you would have previously placed on top of a perforated sheet. Cook in a warm oven for 7-9 minutes at 400. 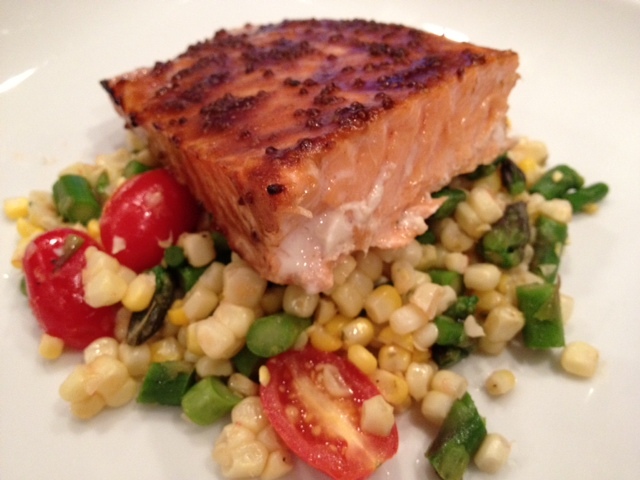 I serve the salmon a top of the summer vegetable mix. I had previously seasoned the corn mixture with 1-2 tbsp of soy sauce. C’est tout!! !